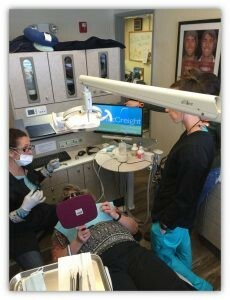 The McCreight Progressive Dental Team in action including international hygiene coach, Ms Jill Taylor (left) of the Las Vegas Institute for Advanced Dental Studies (LVI) doing some on-site training with Ms Jamie Rotunno (right) of McCreight Progressive Dentistry. In our rural practice (McCreight Progressive Dentistry) in Northwest Colorado, we see periodontal disease on average in about one of every two patients, or around 46%. 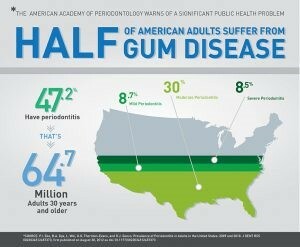 This is representative of the CDC statistic as posted in the May 2015 Journal of Periodontology. Whenever we read these statistics, we are puzzled. In an industrialized nation where home care tools and dental technologies are readily available, how can there be so much disease? Here are some measures (newer technologies) we have been utilizing for our clients to provide a higher quality of care and reduce the prevalence of periodontal disease. What we are finding is that these measures are being incorporated into our soft tissue program (called the MPDWay™) and are being accepted by our clients, even in a rural setting. Beginning in 2011, we introduced both Perio Protect® trays (trays with 1.7% hydrogen peroxide gel and low dose doxycycline) and OralDNA® salivary testing, as our office standard of care, with the goal to provide better, more predictable treatment outcomes. Both work in tandem; OralDNA® is a salivary test to provide quantitative data to help recommend treatment in a more systematic way and Perio Protect®, as a unique tray system to be used at home to decrease pathogen loads (resulting in decreasing inflammation). We recommend a panel of OralDNA® tests (MyPerioPath®, Celsus One™, OraRisk® HPV and OraRisk® Candida) to all of our clients. But of utmost consideration is to recommend testing to our clients that are showing any signs of inflammation and infection. This allows us to gather as much information and customize our treatment plan on objective data. Knowing in advance the pathogen types, including high risk pathogens, as well as gene markers associated with increased inflammation is simply good medicine. When a well-trained team is armed with the salivary test results, many of our clients choose beyond the level of basic coverage from their respective dental benefit plan. Furthermore, the test reports provide objective information that helps the client understand and own their disease. Clients move in a direction of treatment resulting in better gum health since the test helps explain why the gum disease is happening. 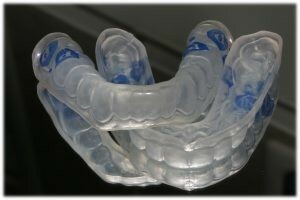 Upper and Lower Perio Protect® Trays. The addition of Perio Protect® into our treatment protocol has also been successful. At first, the trays were recommended by our office to the client’s home care routine when both electric tooth brushing and oral irrigators were not effective. We now incorporate the use of these trays from the very beginning of treatment, even before active therapy but not before we ideally perform the OralDNA® (MyPerioPath®) test. The test results before treatment, after treatment and as a monitoring tool helps us confirm the effectiveness of this tray system. 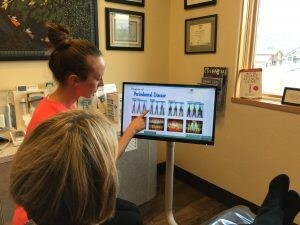 McCreight Progressive Dentistry hygienist, Ms Jamie Rotunno explaining the progressive of bone loss and resultant gum disease to a dental client via the MPDWay™. Watch this video of Dr Jim McCreight performing OralDNA® salivary testing on himself.